Feeling crafty? It's time to dig out that giant bin of wine corks you've been collecting - yeah that one - and get to work. After all that hard work of drinking and saving, you can finally put your efforts to good use, especially when it comes to home decor. Wine bottle corks and champagne corks are the ideal material when it comes to DIY projects. They came free with the wine bottle and they can be turned into some seriously creative craft ideas. Best of all, they came free with the wine bottle and upcycling them is an eco-friendly way to help the environment. From a bath mat to jewelry, the options are almost endless. Gather up your pals, because once you get a load of these 15 wine cork DIY projects, it's going to be crafts and wine time. How genius is this? The wine cork boot tray is the perfect spot to dry off your boots and keep muddy footprints from messing up the floors. It takes a bunch of corks, though, so save them up! Head on over to Earnest Home Co. for this fun DIY and find out how it's done. If a wine cork was meant to be upcycled into anything, then it's a bulletin board perfect for the cork display. Don't go for any old, drab boring bulletin board though. Mix it up and try making this Rustic Bulletin Board. With its rustic design, the whole cork board can be made out of old material giving you a greener, craftier finished piece. You could even frame a chalkboard for a fun twist on this DIY wine cork decor. Have a boring glass vase? Decorate it with wine corks! Wine cork vases can transform any boring old vase into a crafty decorated centerpiece. If you don't happen to have one around, checkout the local thrift store or hit up Michael's to see what's on sale. Looks don't matter, just be sure it's the size you're looking for. When you're ready to hunker down and get started, you'll need a ton of wine corks, scissors, heavy duty glue, and a vase. 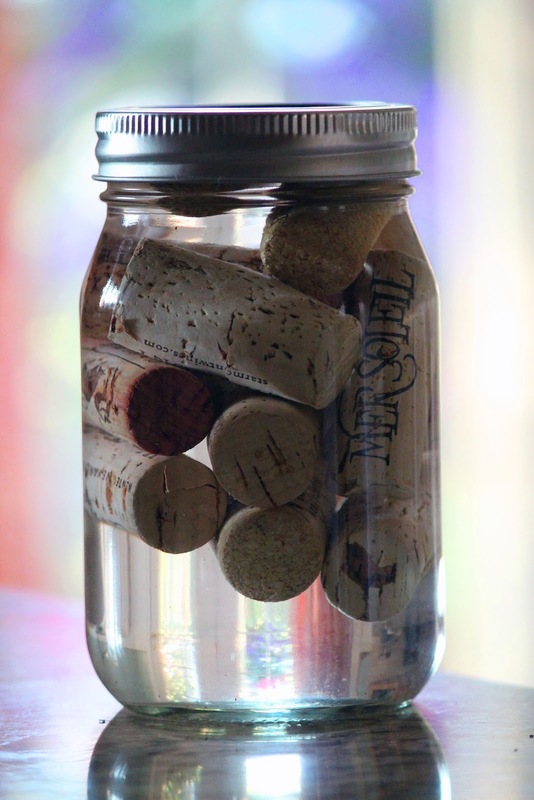 Sort through your corks to find ones of similar size, then start gluing around the vase. It's pretty easy really. But just in case, let a pro like Design Improvised show you how it's done with this tutorial here. If you're feeling half-crafty, use your wine cork art as a vase filler instead. Green thumb or not, these mini air plant planters are easy to make. Their cute size adds life to any space, and if you forget to water, don't worry, air plants require little maintenance. And with no need to plant in soil, you can put these magnets just about anywhere! Grab a few wine corks, glue, magnets, and air plants, then head on over to Green Thumb White Apron and see how one of these wine cork projects is done. Your wine cork collection aren't just for wine and household DIY projects. They also make for adorable earrings that look so quirky on your jewelry organizer. Just take a look at these cute Wine Cork Bee Earrings. The secret to making these earrings is a good knife, and a rubber stamp. And of course, a knack for wine cork crafts! Want more jewelry ideas? Why not recycle those wine corks into a pendant. These pendants can be whatever you want them to be. The trick is finding a cool stamp design that fits your personality. Oh, and here's a little side tip from the pros. Don't stamp the cork, press it into the stamp instead for a cleaner finish. Find out how to make the rest of the pendants here. If you don't want to buy stamps for your pendants, then make your own instead. By carving out the bottom of your wine cork, you have the perfect stamping devices. Make hearts, stars, or any other shape you can think of. Pop on over to DIY Candy for the full tutorial. Once you make all you're wine cork jewelry, you're going to need a place to keep it. So stick with the theme and make your own wine cork necklace holder to add to your wine cork wall. This Ombre Necklace Rack is precisely what you need for your cork jewelry. It takes up limited space, and it will help keep you organized. And, you can paint it any color you like so it won't clash with the room. What better way to recycle your wine corks, than with wine charms! 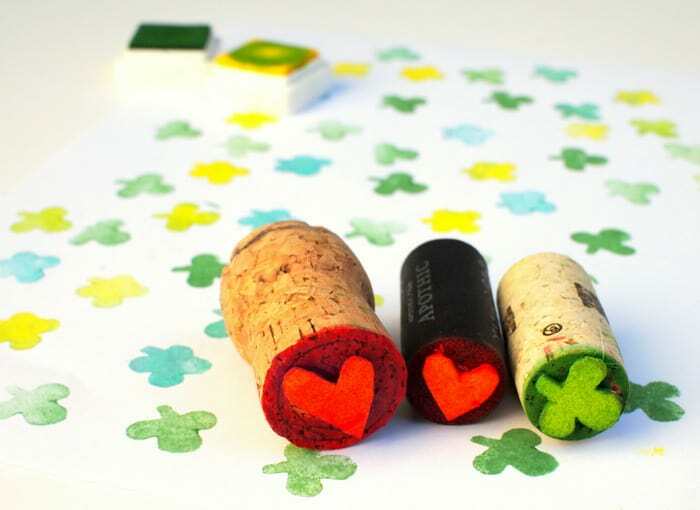 Cutting out a small round piece, six wine charms can be made from one cork. While it takes a bit of patience to make these charms, the end product is well worth it. Once your friends get a load of these, you're going to have to have your own DIY tutorial crafts and wine party because they will want their own! Learn how you can make your own seashell wine charms here. Maybe you'll even move onto bottle stoppers next. When you're sipping on a glass of wine, odds are you're going to need some good cheeses to pair with it. How great will these knives go with that? Checkout this tutorial to see how you can transform your knifes into a wine theme to match. When you're sipping on your wine, trying to collect your corks, you're going to need a coaster to put your glass on. So why not make some wine cork coasters or a wine cork trivet? By gluing all the corks together and wrapping with a ribbon, you're tables will remain wine glass ring free. These coasters also make for fun gifts, so keep on drinking because the next holiday is just around the corner. Take a look how to make these coasters here. Like fishing? Why not take your wine corks and turn them into a fishing lure? Wine cork fishing lures can help you catch a fish on a dime. With the help of a few fishing hooks, you're cork will be catching a fish in no time. Get the lowdown on cork fishing lures at Wide Open Spaces. Of course, you couldn't go fishing without a bobber. Here to complete your fishing line needs is a tutorial on how to turn your cork into a Fishing Bobber. With a few extra supplies and some craft skills, you'll be ready to sit on a dock and reel the fish in. This is so much more useful than wine cork monogram art. Whether you're in to big DIY projects or not, this is one use of wine corks that everyone can use. There's not need to worry about matches or lighter fluid when you have Wine Cork Firsestarters around. All you need is a good jar, some rubbing alochol, and a handful of wine corks. Then when you're ready, light the fire. 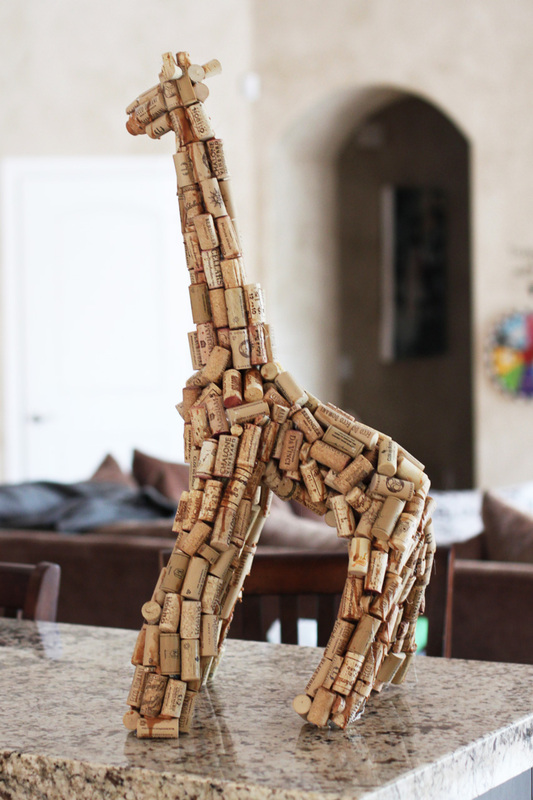 If your inner artist is calling you, then you need to make this Giraffe Wine Cork Sculpture. Be forewarned, this project isn't for the those with little attention spans. If you keep at it though, you will wind up with a masterpiece worth talking about.